The kiosk operator and organic-food distributor both posted double-digit declines as they announced worsening business trends. That move helped the S&P 500 (SNPINDEX:^GSPC) shed 13 points, or 0.64%, as the Dow Jones Industrial Average (DJINDICES:^DJI) lost 163 points, or 0.86% on the day. 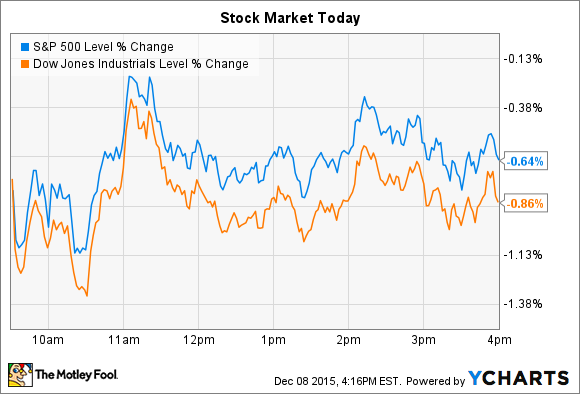 Both indexes are nearly flat year to date, with just a few trading days left in 2015. As for individual stocks, kiosk retailer Outerwall (NASDAQ:OUTR) and food distributor United Natural Foods (NYSE:UNFI) were two of the market's biggest movers today, each falling by double digits after revealing worsening business trends. Outerwall, the operator of Redbox DVD rental kiosks, saw its stock plummet by 23% after the company slashed its sales and profit outlook and announced a shakeup of the Redbox management team. Executives downgraded their fourth-quarter revenue estimate to $1.76 billion from the $1.8 billion they had projected in late October. The earnings outlook also worsened significantly, falling to $7.90 per share at the midpoint of guidance, down from $9.17 per share. Today's announcement is an admission that neither of those initiatives succeeded at getting customers back to renting at what Outerwall considers a more usual rental frequency. Natural and organic food distributor United Natural Foods' stock fell 16% after announcing surprisingly weak third-quarter earnings results. Revenue grew by 4%, as expected, but earnings of $0.63 per share missed consensus estimates as profitability took a turn lower: Gross margin fell to 15% of sales from 16% a year ago. "Our results reflect an evolving marketplace for natural and organic foods. As consumers demand healthier options, rapid adoption of natural and organic products across sales channels has increased the competitive nature of our industry," said CEO Steven Spinner. The rising competition is expected to negatively impact the business for at least the next three quarters. Executives lowered their sales growth outlook for fiscal 2016, saying they now expect revenue to climb by 4% at the midpoint of guidance. That's below the 5% they had originally projected, and a far cry from the 20% revenue gain that the company posted in its 2015 fiscal year. Meanwhile, full-year earnings are now targeted at $2.84 per share, representing no growth over last year's $2.85-per-share haul. Spinner said that the company is encouraged by the fact that food contract extensions remain strong, which points to continued confidence in the brand by its customers. Yet investors appear to be worried that rising competition will continue to chip away at United Natural Foods' sales growth and profitability profile.